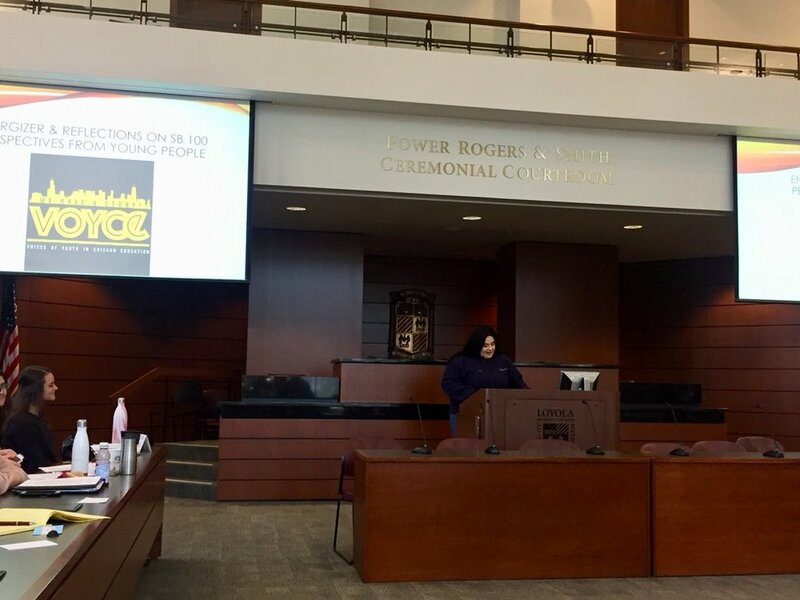 Last Thursday, our Education Equity Project together with members of the Transforming School Discipline Collaborative convened more than 150 educators, policy makers, administrators, student organizers, and advocates to reflect on progress since the passage of SB100, a bill that was intended to transform school discipline practices in Illinois and weaken the school-to-prison pipeline. Candace Moore, Staff Attorney with the Education Equity Project, says that for her, "This was an opportunity to come together to have an honest conversation about where we are and where we aren't - what we have done and what we still need to do." SB100 refers to Illinois Public Act 99-456. The bill became law in August 2015, but advocates and educators continue to call it by its easy-to-remember name, SB100. This law created guidelines to limit school suspensions and expulsions while encouraging proactive programs and services for students with behavioral challenges. Its goals were to limit lost instructional time, to reduce the racial disproportionality of school exclusions, and to encourage educators to engage with the social-emotional needs of their students. VOYCE (Voices of Youth in Chicago Education), an organization key to SB100's passage, has described the law as "perhaps the most aggressive and comprehensive effort ever made by a state to address the 'school-to-prison pipeline.'" "Harsh discipline is not the way to address what our students are going through in their daily life." Amina Henderson of VOYCE recounts her own experience with harsh discipline and police in her school and stresses the need for all school personnel to be knowledgeable and committed to restorative justice and trauma-informed practices. Youth organizers with VOYCE expressed a wish that schools recognize a student as a full person, rather than just a disciplinary problem. Educators and advocates from across the state echoed the call to approach student behavior as an opportunity for engagement, instead of a trigger for punishment. School psychologists, social workers, and administrators shared promising practices for trauma-informed social-emotional education and restorative justice, such as student-teacher mediations and peer reconciliation panels. Illinois Senator Kimberly Lightford, who led the effort to pass SB100, kicks off the day. 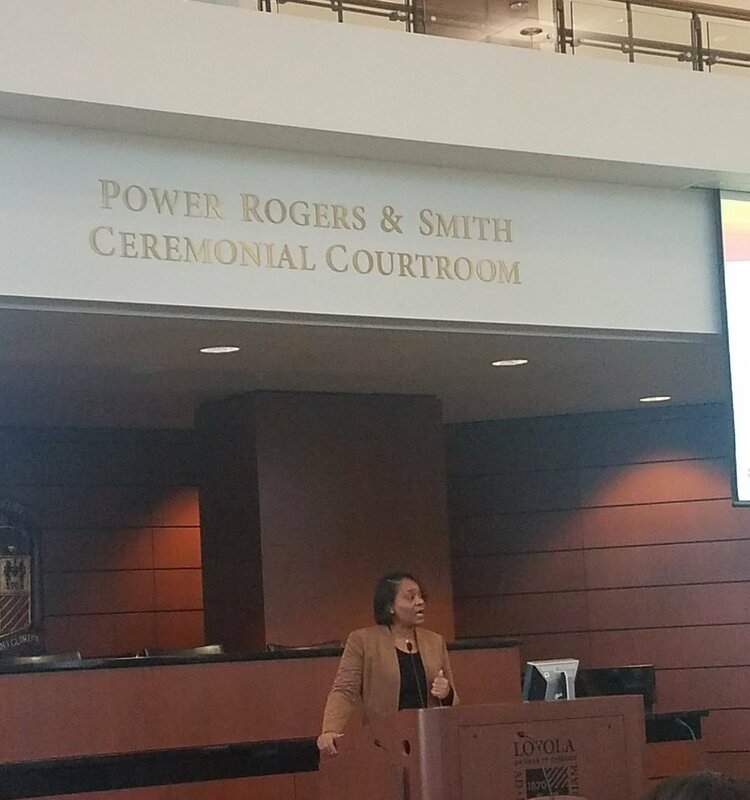 In her opening remarks, State Senator Kimberly Lightford (4th District) explained that racial disproportionality in harsh discipline in Illinois schools helped motivate her to pass SB100. Researchers from Governors State University and Loyola University discussed the persistence of this disproportionality and demonstrated that in spite of modest progress toward reducing suspensions and expulsions, Illinois' students of color, and especially Black students, continue to receive more than their fair share of exclusionary discipline. Kelsie Reed, a researcher from Loyola School of Education, showed that students of color in Illinois school districts were typically 2-6 times more likely to face suspension than their white peers during the 2016-2017 school year. In at least 17 school districts, students of color were ten or more times likelier to face suspension. 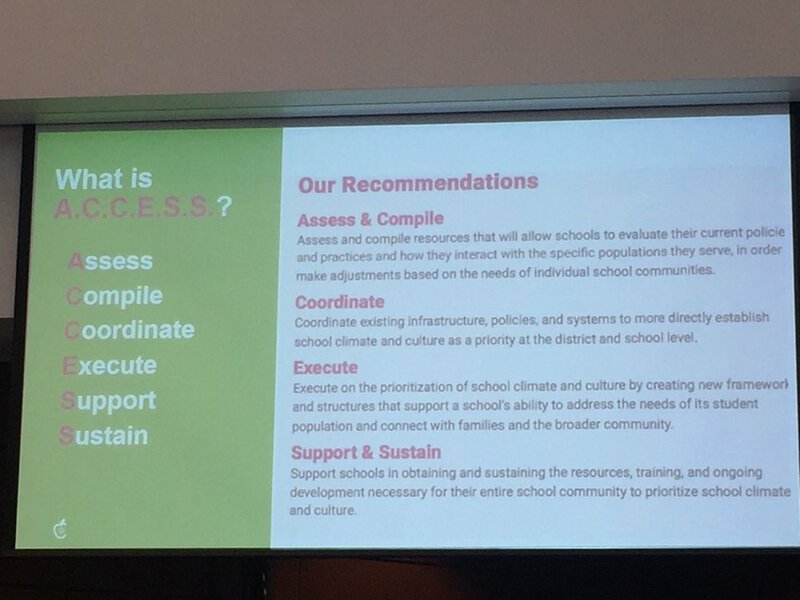 Educators for Excellence recommends that schools get support in obtaining and sustaining resources to strengthen school climate and culture. Throughout the day, participants kept returning to one question: How can schools provide expert, trauma-informed disciplinary measures without additional funding? One source of promise is HB4208, a bill that would establish a grant program for schools to implement discipline improvement plans. Speakers also reminded participants that suspensions and expulsions have their own cost. The Convening also gave participants the opportunity to learn from educators already transforming their school climate and culture. Many presenters even offered to provide free trainings, books, and other services. Candace reflects, "This work is always going to be easier with money...but there is so much that we can be doing right now while we are advocating for more resources for this work." The Convening demonstrated that, although Illinois schools have a long road ahead before they can realize the vision of SB100, there is a great deal of energy and commitment from a broad coalition that includes teachers, administrators, lawmakers, students, psychologists, and social workers. Stakeholders looking for ideas and expertise will find many allies in districts and universities across the state. 2. Get informed. The Transforming School Discipline Collaborative will be sharing presentation materials on their website soon. Read the Educators for Excellence report on school climate and culture, Sounding the Alarm and the Teach plus policy report, From Zero to SB100: Teachers' Views on Implementation of School Discipline Reform. 3. Volunteer. Sign up to become a volunteer attorney with our Education Equity Project. At the Education Equity Project, Candace says, "The work continues." "A lot of what I'm hearing right now is not resistance," Candace explains. "It's a need for organization and a need for us to build together."